Glial cells are a cell type that are found between nerve cells that share a general function of holding the CNS together. There are more glial cells than nerve cells and thereby constitute half of the total volume of the CNS. The four types of glial cells are: oligodenrocytes, microglia, epndymal cells and astrocytes. 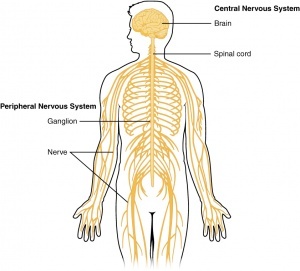 Ventricals and the central canal of the spinal cord are fluid-filled spaces within the CNS that contain cerebrospinal fluid. Both are common locations for tumours. Tentorium Cerebelli is an extension of the dura matter that separates the cerebellum from the inferior aspect of the occipital lobes. Tumour below the tentorium are called infratentorial and those above are called supratentorial. Ependymomas are traditionally thought to arise from oncogenetic events that transform normal ependymal cells into tumor phenotypes. The precise nature and order of these genetic events are unknown. An MRI is the gold standard for individual who may have a brain or spinal cord tumour. 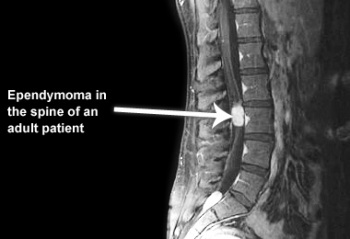 If the MRI confirms a primary tumour, patients normally do not need other imaging tests of the bod because ependymoma tumours do not tend to spread outside of the CNS. MRI scans provide a baseline so as to measure disease progression as well as identifying areas that have been affected. Tumours are classified and graded according to their appearance when viewed through the microscope follow the collection of cells from biopsy. The most severe tumour associated with a higher grade. This entity is characterised by cuboidal tumour cells, with GFAP expression and lack of cytokeratin expression, surrounding blood vessels in a mucoid matrix. Mitotic activity is very low or absent. Subependymoma has isomorphic nuclei in an abundant and dense fibrillary matrix with frequent microcysts; mitoses are very rare or absent. This neoplasm has moderate cellularity; mitoses are rare or absent and nuclear morphology is monomorphic. Key histological features are perivascular pseudorosettes and ependymal rosettes. Four histological variants have been described: cellular ependymoma, which has hypercellularity and increased mitotic rate, papillary ependymoma, clear cell ependymoma and tanycytic ependymoma. This tumour is characterised by hypercellularity, cellular and nuclear pleomorphism, frequent mitosis, pseudopalisading necrosis and endothelial proliferation. The latter two criteria do not appear to be independently related to prognosis. Perivascular rosettes are a histological hallmark. Many factors impact decisions about the treatment of ependymoma including the tumor location and grade, and the age of the person. Children and adults tolerate treatments differently, for that reason treatment for adults and treatment for pediatric patients may be very different. When possible, removing the tumour from the brain or spinal cord is a priority. A secondary goal of surgery is obtaining a biopsy of cancerous cells for diagnosis. 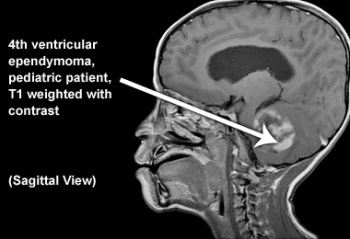 External beam radiation treatment is commonly used to treat ependymoma. Beams of X-rays, gamma rays or protons are aimed at the area of head or spine where the tumour is located. The treatment aims to kill cancer cell and shrink tumours. The treatments last several weeks. Chemotherapy is drug treatment for cancers or tumors. There are many types of drugs used to treat cancer. Traditionally cytotoxic agents designed to kill growing tumor cells are used. These agents often have side effects such as hair loss, nausea and vomiting and can cause a decrease in blood counts. Neurofibromatosis type 2 service delivery in England. Interdisciplinary management of hemicorporectomy after spinal cord injury. If you have a case study to report and you would like to contribute to Physiopedia, please join and share your experiences. ↑ 1.0 1.1 1.2 1.3 1.4 Cern-foundation.org. (2017). Ependymoma Basics | CERN Foundation. [online] Available at: http://www.cern-foundation.org/education/ependymoma-basics [Accessed 24 Aug. 2017]. ↑ Palastanga, N., Field, D. and Soames, R. (2012). Anatomy and Human Movement: Structure and Function. 6th ed. Burlington: Elsevier Science. ↑ 3.0 3.1 Emedicine.medscape.com. (2017). 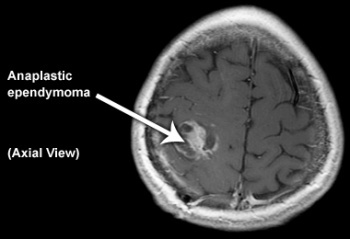 Ependymoma: Practice Essentials, Background, Pathophysiology. [online] Available at: http://emedicine.medscape.com/article/277621-overview [Accessed 30 Aug. 2017]. ↑ Reni, M., Gatta, G., Mazza, E. and Vecht, C. (2007). Ependymoma. Critical Reviews in Oncology/Hematology, 63(1), pp.81-89. ↑ Louis DN, Perry A, Reifenberger G, von Deimling A, Figarella-Branger D, Cavenee WK, Ohgaki H, Wiestler OD, Kleihues P, Ellison DW. The 2016 World Health Organization Classification of Tumors of the Central Nervous System: a summary. Acta Neuropathol. 2016 Jun;131(6):803-20. doi: 10.1007/s00401-016-1545-1. Epub 2016 May 9. Review. PubMed PMID: 27157931. ↑ Wu J, Armstrong TS, Gilbert MR. Biology and management of ependymomas. Neuro Oncol. 2016 Jul;18(7):902-13. doi: 10.1093/neuonc/now016. Epub 2016 Mar 28. Review. PubMed PMID: 27022130; PubMed Central PMCID: PMC4896548. ↑ Reni M, Gatta G, Mazza E, Vecht C. Ependymoma. Crit Rev Oncol Hematol. 2007 Jul;63(1):81-9. Epub 2007 May 4. Review. PubMed PMID: 17482475. ↑ Lloyd SK, Evans DG. Neurofibromatosis type 2 service delivery in England. Neurochirurgie. 2016 Jan 27. pii: S0028-3770(15)00279-9. doi: 10.1016/j.neuchi.2015.10.006. [Epub ahead of print] PubMed PMID: 26826883. ↑ Tuel SM, Cross LL, Meythaler JM, Faisant TE, Krajnik SR, Hogan P, Sewell L, Wilson B, Rodwell DW, Smith J. Interdisciplinary management of hemicorporectomy after spinal cord injury. Arch Phys Med Rehabil. 1992 Jul;73(7):669-73. PubMed PMID: 1622324.